The evolution of the doorbell, and some spare thoughts inspired by a doorbell malfunction in the middle of the night on a weekend. A quick shout-out to our sponsor today, Lemonade. More on them in a little bit. — An advertisement for the firm Mell-O-Tone, which specialized in selling electric door chimes, circa 1933. The marketing pamphlet, according to The Doorbell Museum, was one of the first of its kind, and predicted a broader trend toward less abrasive doorbells that relied on chime sounds rather than bells. Depending on the time of day, a doorbell can be a source of comfort (the arrival of a friend or family member), an annoyance (oh God, the Verizon guy is here to sell me something again), or it can even feel like a risk. If someone rings your doorbell at 2 a.m. in the morning, it stands out as a point of dissonance. Alarm clocks are always annoying, no matter what time of day you hear that God-forsaken blare. As I wrote last year, in many ways the alarm clock and the doorbell often inspired one another, even if the sounds they ultimately made couldn’t be more different. 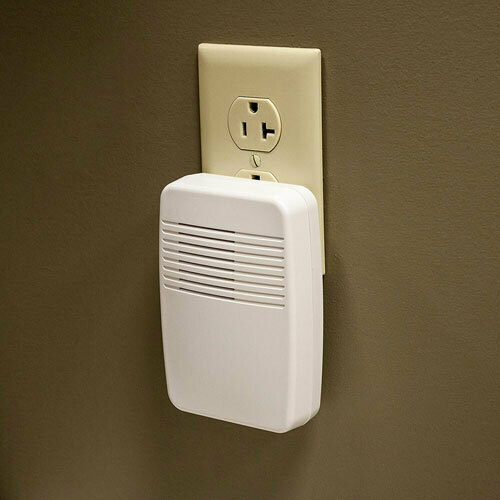 The abrasiveness of the piezo buzzer in your average alarm clock would not be welcomed on a doorbell. But doorbell design is fascinating in the way that it’s evolved—because ultimately, it’s meant to be as welcoming at the mat that you step on. As I explained in that the alarm clock piece, the electric doorbell dates back to the 1830s, when Joseph Henry, the first secretary of the Smithsonian Institution, created a bell that would be rung using an electric current. It should be noted that the electric doorbell was not the first kind of novel doorbell. William Murdoch, a Scottish inventor who generally is credited with popularizing the idea of gas lighting in the home the 18th century, also came up with one of the earliest approaches to the doorbell, one that relied on a pneumatic tube. The house Bell is moved not by a wire but by a column of air in a pipe having a piece of glass tube at each end with pistons fitted in, so moving the piston at the door, the piston at the bell having a knob upon it strikes the bell. It performs perfectly well, never fails to act, and has been in operation several years. While these inventions were important, the device took a while to evolve into an electric buzzer, generally because the average consumer that did not have electricity in the 19th century, it was more likely that the first doorbells they saw were mechanical—and if they did see an electric one, it’s because they made it into the 20th century. Some of the earliest designs for common doorbells are said to have originated in the 1870s, particularly in the Victorian era, and were often as novel as anything that involved electricity or pneumatics. A general design commonly seen from this earlier era, as shown in the above video, involves a ringer sticking directly out of the inside door, along with a button on the other side that the visitor presses. The doorbell slowly evolved from there, starting to gain uptake in its electric form by the early 20th century. As I mentioned above, the alarm clock and doorbell share a lot of common ground, but eventually diverged from one another. A big point of diversion came around the 1930s, when the door chime came to prominence. As The Doorbell Museum, a website dedicated to all things doorbell, notes, makers of chimes (and the marketers that had to sell those chimes to Middle America) had the perfect in for making their case. 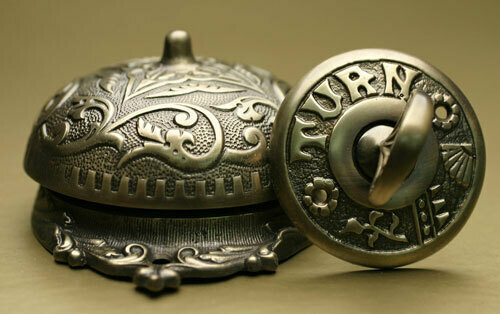 Door bells were annoying—they distracted you, and they weren’t very subtle about it! 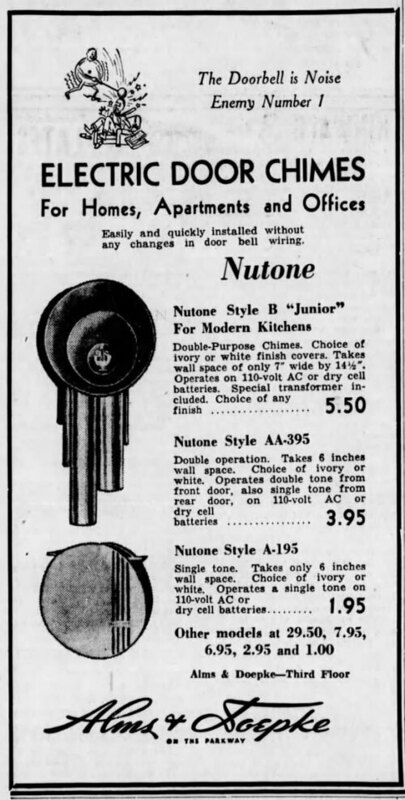 One still-operating manufacturer, Nutone, went so far as to call the doorbell “Noise Enemy Number 1” in advertising. Before the doorbell got smart, it got subtle. Insurance was supposed to be a good thing—we’d pool our money together and if something bad happened to one of us, we’d be covered. But insurance companies have since become the big bad wolves who take all our money and make us wait an eternity to receive claims (if at all). Introducing a refreshingly different approach to insurance. Lemonade has transformed the insurance model—treating your money as if it’s just that—yours. No more long waiting times and fighting claims. Lemonade takes a flat fee, pay claims super fast, and give back what’s left to causes you care about. You heard that right. Lemonade donates all unclaimed premiums to communities and non-profits you care about. In the past few decades, the modern doorbell has evolved into a product that has turned the real chimes of the ding-dong doorbell into something more clearly artificial. A major factor for that, of course, is cost. Hop on Amazon and search for door chimes, and you’ll see that an electronic doorbell with speaker can be had for just a few dollars—and will probably have a design directly inspired by Nest, because that’s what home electronics are today. The more traditional kind—the ones with the actual bells and ringers—generally cost a lot more. A Nutone chime goes for more than $200 today, but it probably has the craftsmanship of a nice watch. My home uses a wireless doorbell, which probably makes us far from unique in 2019. It’s fairly spartan and doesn’t stand out. But while this doorbell design, made of plastic and easily forgotten about (again, I didn’t even realize the plastic box on my wall was an electric door chime until it wouldn’t stop ringing at 2 a.m. in the morning) isn’t exactly winning any awards for industrial design in 2019, it’s still worth discussing because of the technology baked inside. Wireless doorbells are based on radio technology, meaning that they operate in ways similar to walkie talkies and baby monitors. They have a lot of range, as they’re designed to be used throughout a home, but on the other token, they’re prone to interference. If some idiot wanted to mess with you by futzing with your doorbell signal from a car parked across the street, they probably could. There are strategies around this, of course—many doorbells come with privacy codes that are designed to allow you to switch your frequency and like out home doorbell invaders—but this, again, is inexpensive technology. One happy side effect of the fact that doorbells are so cheap these days is that they can be easily replaced, something I might want to do given recent events, but it also makes wireless doorbells excellent targets for DIY projects. Before there was Raspberry Pi, there was the electric doorbell. 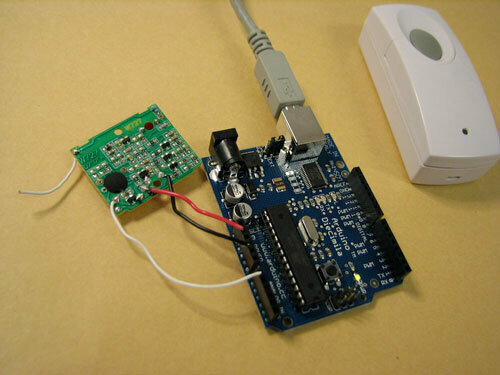 A 2006 blog post from the website Hackers Bench, a website known for taking consumer products and bending their use cases, published a strategy for turning a cheap electric doorbell into a push-button controller. His piece goes in depth about how, when you break it down, the doorbell is a long-range switch with functionality similar to a garage door opener, and with a little know-how, can be reprogrammed to do different things. 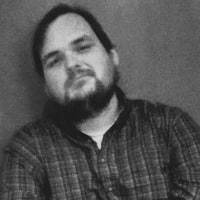 In fact, Hacker’s Bench author John S. was inspired to make the hack for two reasons: One, someone on a forum he frequented wanted a way to turn off their PC remotely using a switch, and two, he needed a way to turn on his driveway floodlights without using an infrared sensor—and being in Arizona, there were concerns of Mother Nature at play. It’s far from the only effort, either. Hackaday, for example, has published repeatedly about doorbell experiments over the years. My personal favorite comes from 2012, when a Bulgarian man named Martin Harizanov modified a doorbell to add a wireless receiver—which lets it send a text message every time the doorbell rings. The doorbell is ripe for experimentation, especially considering how cheap they go for nowadays. It’s no wonder they eventually got smart. The year that inventor Edward D. Phinney filed a patent for a “television system,” in which apartment dwellers would use a television screens in their home as “a means of communication between a common entrance doorway and the several individual apartments inside the building.” This general idea, perhaps with a little more polish, some clever rebranding (as Ring), and slightly updated technology sold to Amazon 84 years later at a hard-to-ignore $1 billion. As much as it would add a degree of drama to my life that some hacker decided to play a practical joke on me, the reason for the malfunction, as far as I can tell, is something more mundane: The button got stuck. I woke up the next morning, plugged back in the speaker, shook around the button, and have yet to run into another ding-dong crisis since. If there is one, I can just pay $10 to get the sounds of synthetic chimes from somewhere else. Maybe if I’m feeling fancy, I’ll pay $200 and live with chimes from the 1930s. The Ring doorbell, a subject of much hype in recent years. But while my nice-and-dumb doorbell is probably not the target of some international crime syndicate, issues have been known to plague the smarter doorbells of the world. 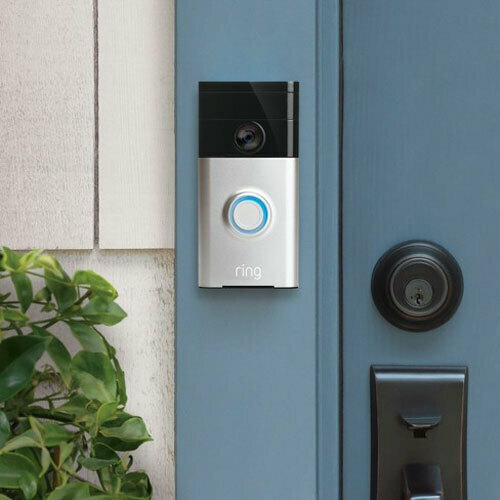 Security experts have been pointing out issues with the hugely popular Ring Video Doorbell for years. In 2016, for example, the company patched a bug that allowed devious folks to steal your wireless password from the doorbell; then in 2017, the firm had to patch its Ring Video Doorbell Pro devices after audio data started being leaked to China for some odd reason. The most recent headache surfaced back in February, when a firm named BullGuard—selling a smart home firewall of sorts called the Dojo—demonstrated how the security-minded doorbell could, with a bit of work on the part of the infiltrator, become subject to a man-in-the-middle attack, allowing the attacker to put its own images in place of the ones actually coming from the camera. Ring was quick to patch it, but The Verge was quick to note that there were flaws with its approach to transparency—a problem for a firm that is actively selling a security tool to the public. “Ring doesn’t display information on its site about whether it encrypts video footage or employs other security measures to protect user data,” writer Shannon Liao. 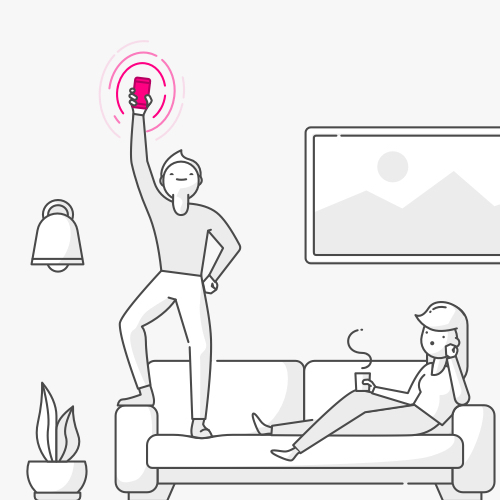 Now, Ring and devices like it represent the next evolution of a device that has evolved many times over the past two centuries—from mechanical to electrical forms. Of things you might want to be smart, I think a doorbell is at the top of the list, as it solves a problem for a lot of folks—you don’t know who’s stopping by. But given my recent doorbell malfunction, I don’t know if I’m in a rush to jump into the future just yet. Let’s get the don’t-ring-at-2-in-the-morning-on-your-own part down first. Then we can talk. Find this one an interesting read? Share it with a pal! And thanks again to Lemonade for supporting this thing we do.